In 1758 two of the British expeditions were successful, with Fort Duquesne and Louisbourg falling to sizable British forces. 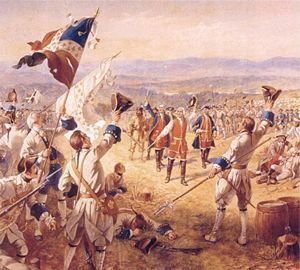 The third was stopped with the improbable French victory in the Battle of Carillon, in which 4,000 Frenchmen famously defeated Abercrombie's force of 16,000 outside the fort the French called Carillon and the British called Ticonderoga. Abercrombie saved something from the disaster when he sent John Bradstreet on an expedition that successfully captured Fort Frontenac, including a large cache of supplies destined for New France's western forts and furs destined for Europe. Abercrombie was recalled and replaced by Jeffrey Amherst, victor at Louisbourg. The Battle of Carillon, also known as the 1758 Battle of Ticonderoga, was fought on July 8, 1758, during the French and Indian War (which was part of the larger Seven Years War and is also known in modern Quebec as the War of Conquest). It was fought near Fort Carillon on the shore of Lake Champlain in the frontier area between the British colony of New York and the French colony of Canada (roughly the present-day Canadian provinces of Quebec and Ontario).